Foreign visitors arrivals into Asia Pacific destinations continued to grow at better than the global average in 2017, reaching a record volume high of more than 646 million arrivals relative to 2016. According to the Annual Travel Monitor 2018 Final Edition (ATM) released by the Pacific Asia Travel Association (PATA) today, international visitor arrivals (IVAs) into 47 destinations in Asia Pacific covered in this report increased by 5.7 percent and added close to 35 million additional arrivals to the collective foreign inbound count into Asia Pacific in 2017. In percentage increase terms between 2016 and 2017, the Pacific had the strongest annual increase at 5.9% year-on-year, followed by the Americas at 5.8%, while Asia kept pace with the Asia Pacific average of 5.7%. By annual increase in the absolute volume of foreign arrivals however, these positions were reversed with Asia receiving close to 25 million additional foreign arrivals between 2016 and 2017, followed by the Americas with a gain of almost 8.6 million and the Pacific with around 1.4 million additional foreign arrivals received over that period. 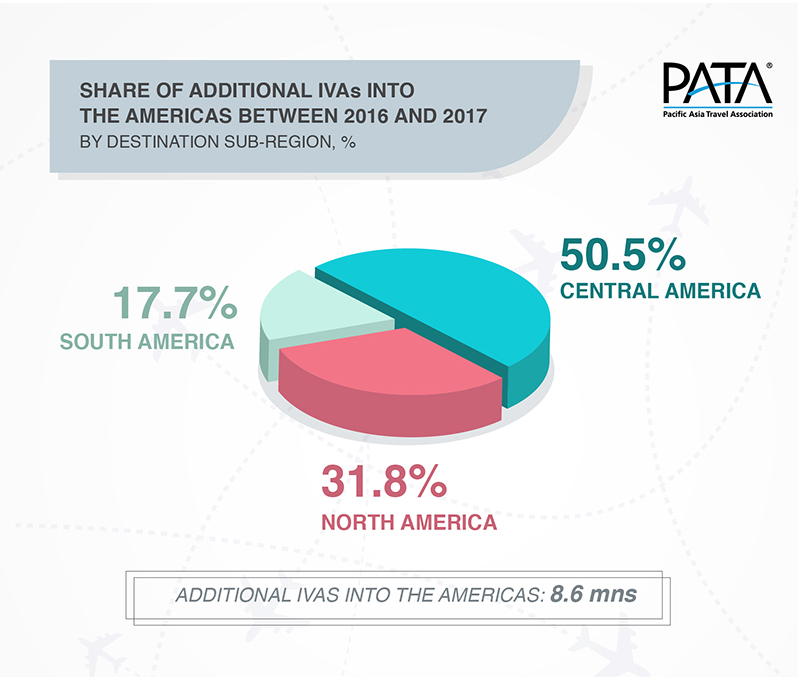 Within the Americas, Central America showed the strongest incremental increase in foreign arrivals between 2016 and 2017, capturing 50.5% of the 8.577 million increase into the Americas over that period. Solo travelers: Where do they go? Antigua and Barbuda Tourism: What is open, what is closed?